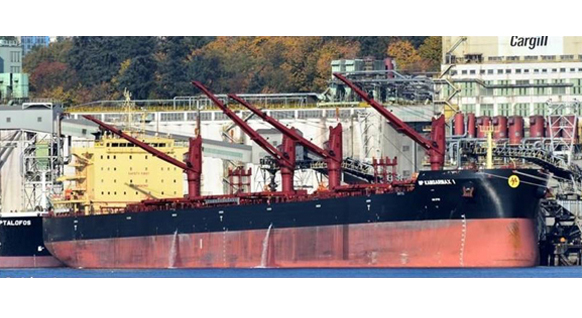 A recent grain loader in Vancouver was the unusual geared Kamsarmax bulk carrier MP Kamsarmax 1. Owned by M. Pallonji & Co. 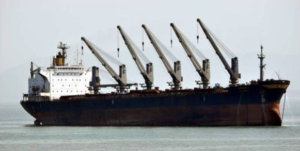 Pvt., of Mumbai, a privately owned Indian shipping company) she is one of a fleet of geared Panamax, Utlramax and Kamsarmax vessels which are primarily engaged in the movement of coal and fertilizers into India. 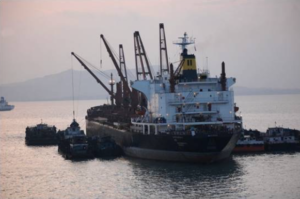 Built by Jiangsu Yangzijiang Shipbuilding Co., Ltd. 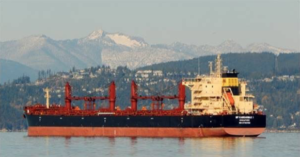 Operated by M. Pallonji Shipping Singapore Pte. Ltd. The M. Pallonji Group of Companies was established at the beginning of the last century, primarily as a paint marketing company. Today, the company’s interests have extended to painting including speciality coatings, dredging, barging, stevedoring, cargo logistics, shipping, investment finance, insurance and auto dealerships, all managed by a diverse collection of privately registered companies. 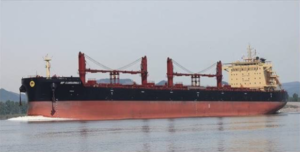 The vessel’s builders, Jiangsu Yangzijiang Shipbuilding Co.,Ltd. were founded in 1956 with production now centred on Jiangyin-Jingjiang industry zone, Jingjiang city, Jiangsu province and Taicang Province, seated in the north side of golden channel of the Yangtze River.